A superb variety from east Malling Research Station. It bears fruit very early in life and is a superb pollinator for other mid-season apples. The fruits are ready for picking at the end of September and will keep well until late November. 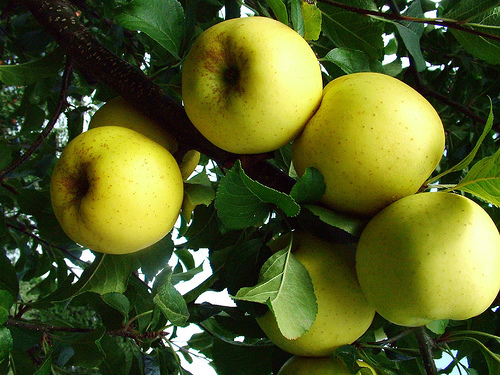 The golden apples are very attractive on the tree, and resemble a much brighter and cleaner Golden Delicious. Pale Yellow, but always having russet around the stalk cavity. The medium to large fruits have crisp, juicy flesh with an excellent flavour. The trees are compact and extremely precocious, fruiting on both spurs and young wood. A very easy to manage tree. The yield is very, very high, cropping at about double that of Coxs Orange. Greensleeves is a cross between James Grieve and Golden Delicious, is partially self fertile, and flowers over a long period. This variety has frost resistance, is fairly hardy and can he grown in the north As Greensleeves is self fertile, it can be grown without any other pollinator and will produce a very worthwhile crop if you only have room for just one tree. For the very best results, plant with a pollinator such as: Coxs Orange, Grenadier, Redsleeves, Sunset etc. Greensleeves is a variety that we very highly recommend. All trees £1.00 extra to normal price.